Keoma is a hamlet, 35 km northeast of Calgary. 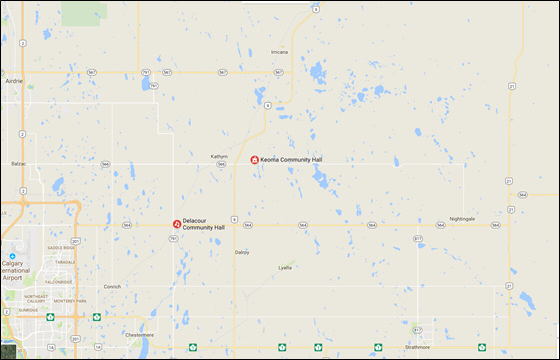 Surrounding communities: Irricana (15 km north), Balzac/Cross Iron Mills (23 km west), Airdrie (35 km northwest), Strathmore (40 km southeast). Closest airport is the Calgary International airport. 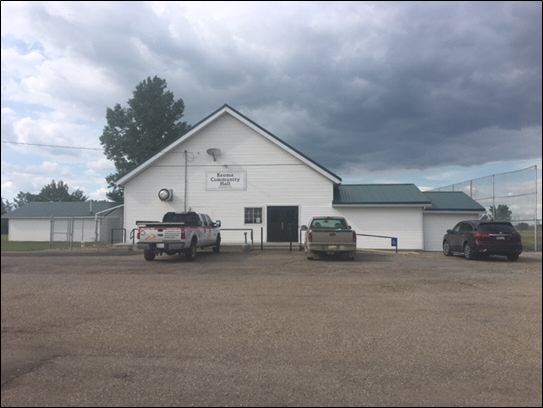 Keoma Community Hall in Keoma, Alberta. All social events and meetings will be held at the Keoma Community Hall. Sunday July 21, 2019 at Keoma Hall. Cocktails at 4:00 pm and banquet starts at 5:00 pm. Tickets are $50 per person. Please prepay with your entry form. 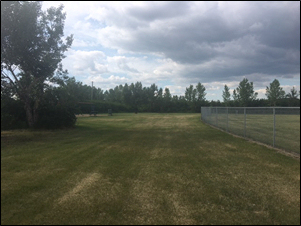 Dry camping at Headquarters around the baseball diamonds, starting Wednesday July 18 through to Monday July 29, 2019. $120 flat fee or $20 per night. Pump outs will be arranged. 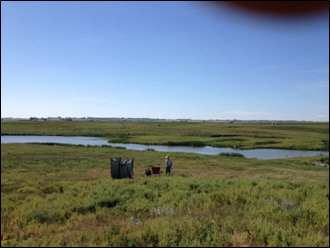 Contact Laura Danforth (403) 510-1275 or laura@bowriverretrievers.com to book HQ camp sites. Founders Park Campground in Irricana. Serviced and un-serviced sites, washrooms and showers, RV waste disposal site. Days Inn by Wyndham Calgary North Balzac is a dog friendly hotel 23 km west of Headquarters. The hotel is near Cross Iron Mills shopping mall. A block of rooms are being held under the name "2019 National Amateur" for National Amateur competitors to book. Rooms are being held until June 1, 2019. Many hotels in Airdrie, Chestermere, Strathmore and NE Calgary. 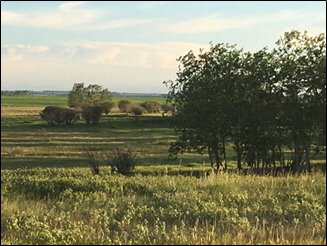 Grazing pasture, cropland, coulees and wetlands located on private ranches surrounding Keoma. Pre-National training grounds will be available Thursday July 18 through Saturday July 20, 2019. You are required to make arrangements at Headquarters to use these grounds. Contact Laura Danforth 403-510-1275. The Animal Care Center of Strathmore. (403) 901-1800 regular hours and emergency. Clinic Hours: Monday to Friday 8 am to 6 pm and Saturday 9 am to 3 pm. 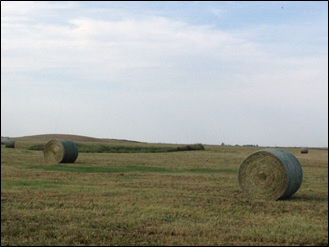 Location: 2 km west of Strathmore on the north side of the TransCanada Highway at Rge Rd 254. 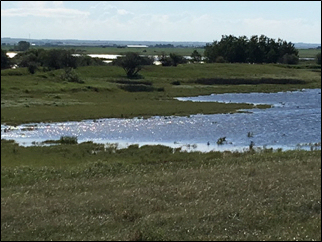 Average daytime high temperature of 24 degrees C and nighttime low temperatures of 10 degrees C. July historically experiences less than 80 mm of rain. Afternoon thunderstorms are common. The days are long with average of 9 hours of bright sunshine each day. Weather in southern Alberta is variable.